In August 2016 when CNN Anchor Chris Cuomo admitted on national television that the mainstream media were "the biggest ones promoting" the Hillary Clinton campaign and that the MSM was giving her a "free ride," many pointed to it as proof of the media bias they had been witnessing since the party conventions had ended, where 91 percent of the coverage of Donald Trump being negative with only 38 percent of Clinton coverage being negative. A quick reminder of those words, from the horses mouth so to speak, below before we delve into the recent Wikileaks bombshell that shows it is not just bias, but actual collusion between the Clinton campaign and journalists, national reporters and television anchors that began before the Clinton campaign officially launched. In the next 15 second clip Cuomo tells CNN viewers to "remember, it is illegal to possess these stolen documents," meaning the Wikileaks hack email releases, and "it's different for the media, so everything you learn about this, you're learning from us." That is a critical 15 second statement because there is one specific Wikileaks release that CNN and a number of other outlets have not informed their viewers about, specifically the fact that dozens upon dozens of "influential reporters, anchors and editors," were invited and accepted invitations to "off-the-record cocktails," with Clinton campaign members days before Clinton launched her campaign. Included in the list of Clinton campaign "goals" of conducting these "off the record" dinners and cocktails with these media members, is "Framing the HRC message and framing the race." 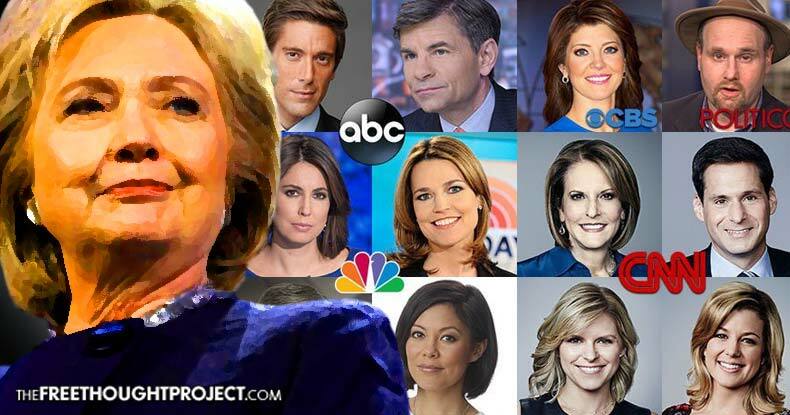 The lists of these media members can be found at Breitbart, and in going through the list, as well as searching for the national coverage by these very same reporters, we see nearly all of them have consistently reported negatively about Donald Trump while giving Hillary Clinton a "free ride," by either downplaying or totally ignoring her scandals, including the Clinton Foundation, pay-to-play, and her email server scandal. 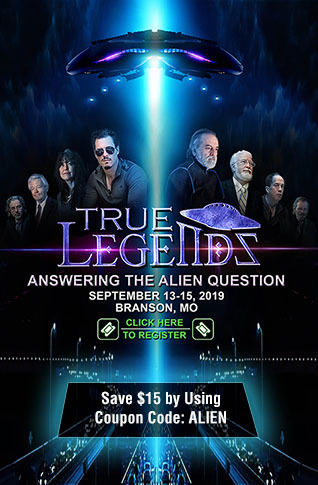 The combined lists, which include more than one get together, shows members from ABC News, CBS News, CNN, Bloomberg, Daily Beast, Huffington Post, MSNBC, NBC, New Yorker, New York Times, People, Politico, AP, BuzzFeed, Reuters, and WSJ.... and those are the ones that RSVP'd saying they would attend. 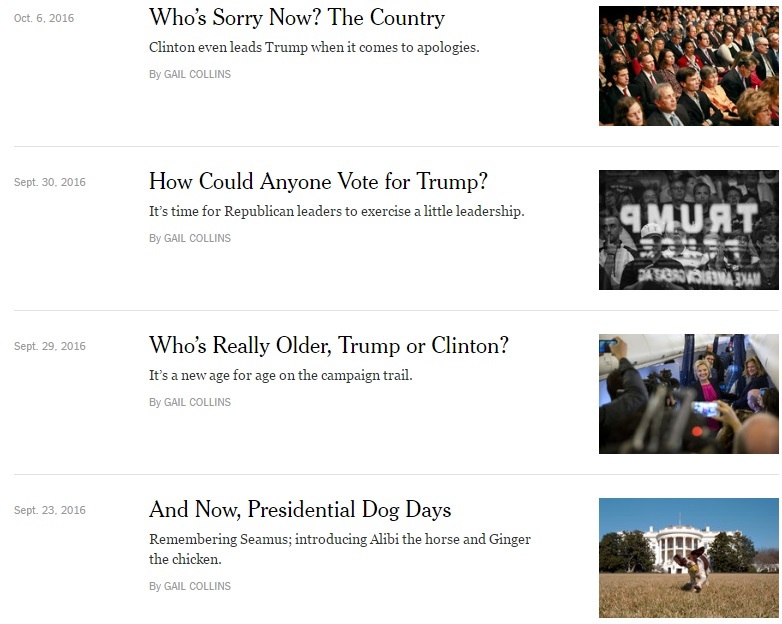 Plugging the names on the list into the search engine along with Clinton and Trump's names, we see a pattern emerge, showing anti-Trump negative and consistent coverage with pro-Clinton positive and consistent coverage. For example, ABC's Cecilia Vega in reporting on the final presidential debate, lamented how Latino's were "were crying, they were offended, downright disgusted," over Trump's use of the phrase "hombres line," as she declared how "brave" Clinton was. Aside from the barrage of coverage following Wednesday’s final presidential debate concerning Donald Trump’s non-commitment to accept November’s election results, there were a few instances where that wasn’t discussed and ABC used their precious airtime to inform us Latinos “were crying” over Trump’s “hombres line” and assured viewers that “Hillary clearly won” the face-off. Clinton campaign correspondent and Saturday World News Tonight anchor Cecilia Vega reported from the spin room that, for the Clinton camp, it was her “best debate” because “she bravely confronted women by quoting Donald Trump, using his own words” despite being “bothered” about Trump’s election comments. In May 2015 it was reported by Politico and others that Stephanopoulos had also donated $75,000 to the Clinton Foundation, to which he did not disclose to ABC News' viewers until after he was revealed by other sources. While previous examples can be found, the latest example of Stephanopoulos' pro-Hillary, anti-Trump bias could be seen in his sit down one-on-one with Donald Trump last week, where he was grilling Trump about his campaign against Hillary, to which has made seriously amusing headlines after the following exchange when Stephanopoulos asked Trump "When you look back over the sweep of this campaign going back to last June is there anything you regret?" Trump replied "I'd love to have done, in life, certain things over I guess. And you would have too." Stephanopoulos then made the mistake of asking Trump to name one, to which Trump shot back with "You would love to have not contributed to the Clinton Foundation as an example. There are things you wish you didn't do. Okay?" Perhaps good ole George should have been more clear,yes? GEORGE STEPHANOPOULOS: At the same time, you were the beneficiary of a billion dollars in free media during the primaries. DONALD TRUMP: I don't know if you call it a billion dollars, free, when it's bad. What it should really be, what they should be talking about is WikiLeaks and the horrible things that have come out about Hillary Clinton. The horrible things. STEPHANOPOULOS: Let's stick on this election idea. 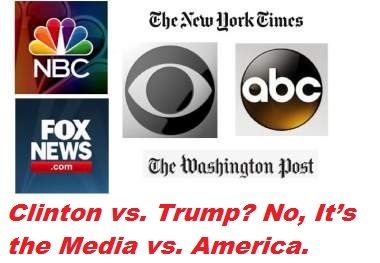 Yes, free media is so much more relevant and important to voters than the corruption and collusion exposed by Wikileaks on the part of the DNC and the Clinton campaign!! Other ABC News reporters on the two lists are David Muir, Diane Sawyer, Jon Karl, and Liz Kreutz. Lets jump to another reporter that accepted the invitation to the Clinton campaign's little get-togethers, Politico's Glenn Thrush, who Wikileaks revealed recently had sent his upcoming article to Clinton campaign chair John Podesta, with a note stating "Because I have become a hack I will send u the whole section that pertains to u. Please don’t share or tell anyone I did this… Tell me if I f*cked up anything." Other Politico reporters on the lists are Mike Allen, Annie Karni, and Gabe Debenedetti. Another listed on the second list of those accepting one of the invitations from the Clinton campaign is CNBC’s John Harwood, who was a moderator for a 2015 presidential debate, and had bragged to Podesta in leaked emails about how he goaded Trump at the debate, as well as multiple other examples of bias found in other Podesta/Harwood emails, reported by Breitbart here and here. Between the two RSVP lists there are nine different CNN reporters, and frankly I do not believe examples need to be shown when it comes to CNN, everybody knows they are in Clinton's pocket and anyone that thinks that point is debatable, go to the top of this article to the first video and listen again to CNN Anchor Chris Cuomo admitting it. Also between the two RSVp lists there are five different New York Times' reporters that accepted the invitations for the off-the-record gatherings to "frame the HRC message" and the race, including, Gail Collins, Jonathan Martin, Maggie Haberman, Patrick Healy, and Amy Chozick, with Haberman and Chozick listed on both lists. 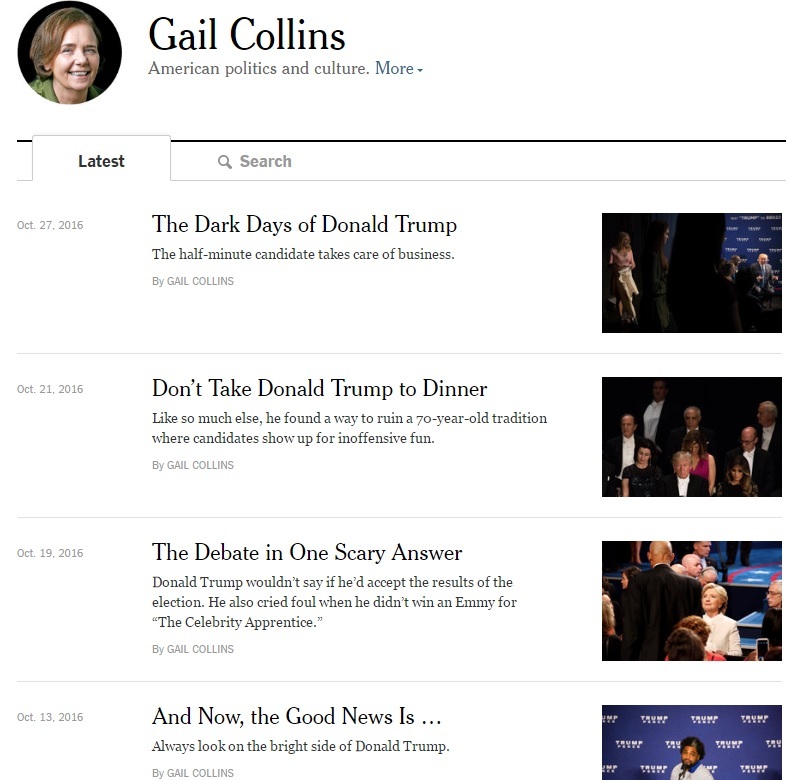 All the NYT names above are linked to their individual article pages, and just using Gail Collins as an example of the type of coverage she regularly offers, here are the headlines listed from September 21 through October 27, 2016. Anyone else noticing a pattern of reporting, specifically by the very journalists that attended the Clinton campaign pow-wows? The guest list for an earlier event at the home of John Podesta was limited to reporters who were expected to cover Clinton on the campaign trail, can be seen at Wikileaks. Just look at the spin we are seeing after FBI director James Comey dropped his bombshell about finding more relevant emails in connection with the clinton email investigation. 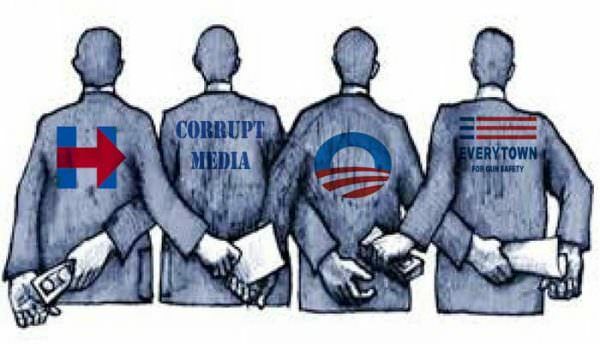 We see the MSM attacking Comey, claiming he is trying to influence the election, and pushing the narrative that Harry Reid claims the FBI has information on Trump ties to Russia, both narratives completely destroyed by the White House itself. Anything to distract from the bombshell that was dropped 11 days before election day and the media is running with it to help Hillary Clinton. Neither Russia, Comey, Trump or Wikileaks forced Hillary Clinton to set up a private server, use said server to send classified information, lied about it, or destroyed 30,000+ emails after receiving a subpeona for them. That was all Clinton. It also wasn't Russia, Comey, Trump or Wikileaks that gave access to thousands of emails, some of which possibly classified to disgraced Anthony Weiner, that was Clinton top aide Huma Abedin.